Danya, a friend of mine, has a cute little condo in one of DC’s cooler neighborhoods. She’s on the ground floor and has a great patio in the back, with a small square of unplanted ground. 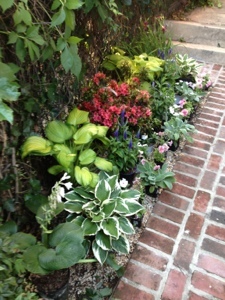 When she heard of my adventures in balcony gardening, she asked if I would be her gardening consultant for that unplanted area – she wanted to do something fun but didn’t feel confident doing it by herself. Of course I said yes — I love designing new gardens from scratch, especially when someone else is footing the bill! My first suggestion was for Danya to start developing her taste and forming opinions by paying attention to plants she liked in other people’s gardens. She did so, and soon her phone was full of snapshots of foxgloves, tulips and poppies. Saturday was our shopping day. I set aside all afternoon for taking Danya to the nurseries. I started with Home Depot, since I knew it would be more economical. As you can imagine, they had tons of the staple bedding annuals (petunias, marigolds, vincas, impatiens) and a very limited selection of everything else. It was also a complete zoo, with millions of shoppers in a relatively small space. I sensed that it was overwhelming Danya, so I recommended that she leave the carts behind and just wander for a minute to get a sense of the inventory and pricing. Then we fled to the Merrifield Garden Center. Cue the heavenly choirs. 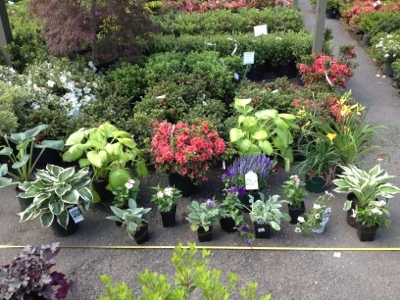 We spent about an hour and a half selecting plants and staging them in an empty corner by the azaleas. We learned that Danya favored color, symmetry, and the lush look of traditional plants like hosta, azalea and day lilies (no spiky grasses for this garden). Once Danya settled on an arrangement we loaded up and bought the things that we couldn’t get at Home Depot, went back to Home Depot to fill in the rest, and then went home. We didn’t have time to plant anything (Danya was hurrying off to a Buddhist meditation party, and I was meeting friends at an art gallery). 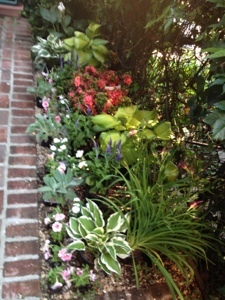 So we just nestled the plants in their designated spots and left planting for another day. Still, it’s enough to see what it will look like when it’s done. Not bad for starting with nothing, right? The rest of the story: Danya called me on Sunday afternoon to let me know that crisis had been averted. Crisis? Yes. 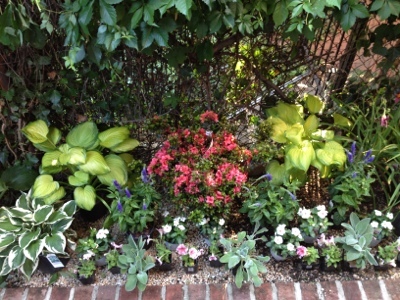 Turns out, when she went to plant her new babies, she discovered that the plot of earth was only about three inches deep: underlying the whole was a pavement of bricks! After a brief panic she managed to tear up enough bricks to plant the azalea. The remainder of the plants were subject to plan B, which consisted in potting everything in roughly the same configuration. A disappointment, yes, but certainly not the end of the world.